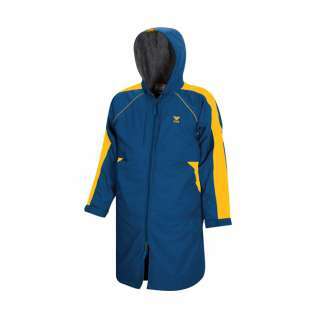 Designed for the aquatic athlete who demands exceptional thermal protection. It is ideal for cold weather and prevents wind and moisture penetration. This parka is very nice! Well worth the price. Very warm and roomy, daughter seems to really like it. Very good quality, the size is perfect. I bought this for my daughter and she loves it! We live in Oregon so its oretty cold after she gets done with practice, she says that it blocks all the wind and cold and it really keeps you warm! We were worried about the hood being to short but its just the right size to protcet you from the rain. The hood still fits even with my daughters hair up in a bun. She is 14 and weighs around 125 and the small was the oerfect size becuase she still has room. The legnth is great, she is 5ft and the parka hits her about 6" below her knees. I really recomend it she loves it!!! Had to return parka for smaller size. Still worried it may be too big when I get the exchange. This parka is extremely warm. Not only it was worn to the pool, it was worn after run practice and working in the yard on a rainy cold winter day! It is definitely go to gear for the winter! Good quality product and good features. My daughter loves it. this is a Christmas present and my daughter loved it. she doesn't want the furry inside and this one has a micro fleece. 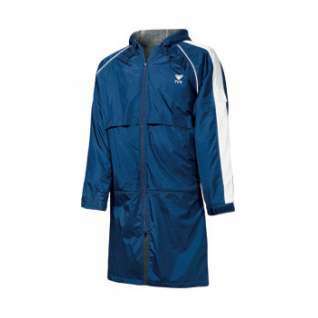 my daughter is an average 14 year old and I picked xs only because I made her try out one of her swim friend;s parka. I think they should put a notice that these sizes run big. I would have ordered a medium since that is my daughter's regular size, but this is unisex so that should tell people that these are big sizes, otherwise an excellent purchase! Excellent quality! We're very pleased with the parkas. Do be careful when ordering as these are unisex sizes. For the typical 14 year-old female athlete I would recommend a XS or S rather than ordering by the recommended height chart.